I spoke about and played music from Nikos Gounaris. We also heard music from Rena Vlahopoulou who unfortunately passed away in 2004. A video with music and photos is below. We also heard Mario Frangoulis and Deborah Myers singing To Domatio. A video of them singing selections from the Phantom of the opera is also below. 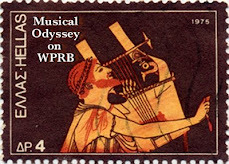 I received a request to hear Manolis Mitsias (there isn't much in this link, I know. If anyone has more info please send it to me) and I thought I would post one of his videos. Below is his classic "Afta ta heria" Great video with dancing too. I talked about Gus Vali and played some of his music. I only played two songs I play his music pretty frequently. 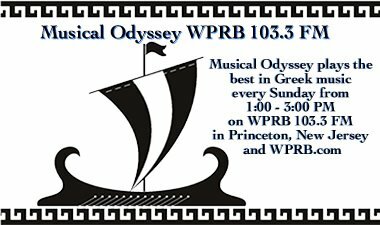 I had planned on featuring Nikos Gounaris but I ran out of time, we will talk about and hear his music next week. As always, comments and requests are welcome: greekmusic@gmail.com or leave a comment below. I don't play enough Vasilis Papakonstantinou but I played the song Kripsou, which is one of my personal favorites. Today we talked about Lisa Andreas and played her Eurovision entry from 2004. A video of her performance is below. We also heard an old favorite "Astoria" from Elly Paspala. Not too much info on here is available but you can see her discography here. I recently saw the movie Sicko and was pleasantly surprised to hear Vicky Leandros singing L'Amour Est Bleu for about 20 seconds or so during the film (video of the song below). During the show, I talked about and played songs by Manolis Aggelopoulos. We heard *3* versions of Socrates, the originals by Elpidia in Greek and English and the remake (from Euro Revisions) by Evridiki (both videos also below).